The small luxury hotel only had six floors and they reached the main floor of the Lord Bryon in few minutes. Michael had been leading her down the stairs but once they reached the main floor he pulled her in front of him, now suddenly worried about getting caught. "Ally check and see who's out there," he whispered conspiratorially. "We don't want no one seeing us leave." She rolled her eyes, "uh... no kidding Waldo." She laughed slightly as she turned to look at him, "I can assure you that neither Bill or Frank will be too happy to find us sneaking around like this." She opened the heavy wood door and poked her head out into the opulent lobby. The hotel, reserved fully for Michael and his tour entourage, was lavishly decorated and tastefully appointed. It was a small hotel made up of 32 rooms and suites, housed in a previous patrician villa dating back to1939. It was set in a quiet residential area of Rome overlooking the famous Borghese Gardens and just a short walk to the city centre. The hotels interior was exquisite, paying homage to Art-Déco style and design with wonderful sculptures and evocative paintings throughout. It was like being in a museum and it was touted as a romantic getaway from the mundane. She scanned the lobby only seeing the reception staff, a bell hop and a few people she didn't recognize even though she knew they were part of the tour. She shut the door, turning to face him, "it looks clear, I don't recognise anyone out there." "Ohhhh girl we shoulda got you disguised too," he replied merrily. "So we'd both be unrecognizable." She almost laughed out loud at his retort. Did he really think he was that unrecognisable? Or perhaps it was just her. There was no way he would fool her in the strange get up that he was wearing. She wouldn't miss him in a million years and she didn't think anyone else would either. First of all his signature black loafers and white socks were a dead giveaway. He wearing a large bushy afro wig that look like it survived the disco era, a cheesy moustache and a full length trench coat buttoned up to the base of his strong lean neck. If she didn't know who he was she would immediately pick him out as some strange man in disguise. He was so not fooling anyone. "I think we are okay with my outfit," she let him know hoping he didn't want to go back upstairs and change. He looked her over, "okay, but we need a map. We can get one from the lobby. Why don't you go get it and I will wait out back for you." She thought he sounded less sure of the idea now that they were about to leave the confines of the hotel. "Michael, are you still sure you want to do this?" He didn't answer. Opening the door he put his head down and walked straight towards the back of the lobby, leaving her little choice but to follow him out. Once she saw that he was safely out of sight she turned to the stand of pamphlets and brochures by the reception desk. She scanned the wood racking looking for something suitable for a walking tour, thinking they wouldn't be going too far. She picked up a street map and a few guides to the attractions in the area. She also grabbed a business card from the concierge desk, remembering she would need to know exactly where they were staying in case they got lost. She tucked map and guides under her arm, while putting the card inside the pocket of her camera bag as she went out to meet Michael. He was standing at the valet parking entrance looking towards the front entrance of the hotel when she found him. "Ally, look at all the fans out there," his voice excited and almost surprised. 'I can't believe they have been there day and night since we arrived. "Umm, I hate to break it to you Michael, but you're kinda really popular right now, in case you didn't know," she smirked at him. "Don't be funny, I just love that they are there. They're always there." He seemed so in awe that his fans were waiting outside for him, like he couldn't believe it. It touched her heart to see him so overwhelmed at the sight of his fans. Like he didn't know how popular he was. "Michael," she touched his arm. "They love you, they're your fans, they will follow you anywhere." She grinned, "well, maybe you should tell them that!" "Mhmmm," he turned back to her. "Did you get the maps?" "Perfect. So where to Ms. Wolf?" "You want me to decide?" "What about you, don't you want you to pick too Michael." "I will, but you can start." "Ohhh, okay," Allison smiled excitedly. There was so much to see had no idea where to really start. 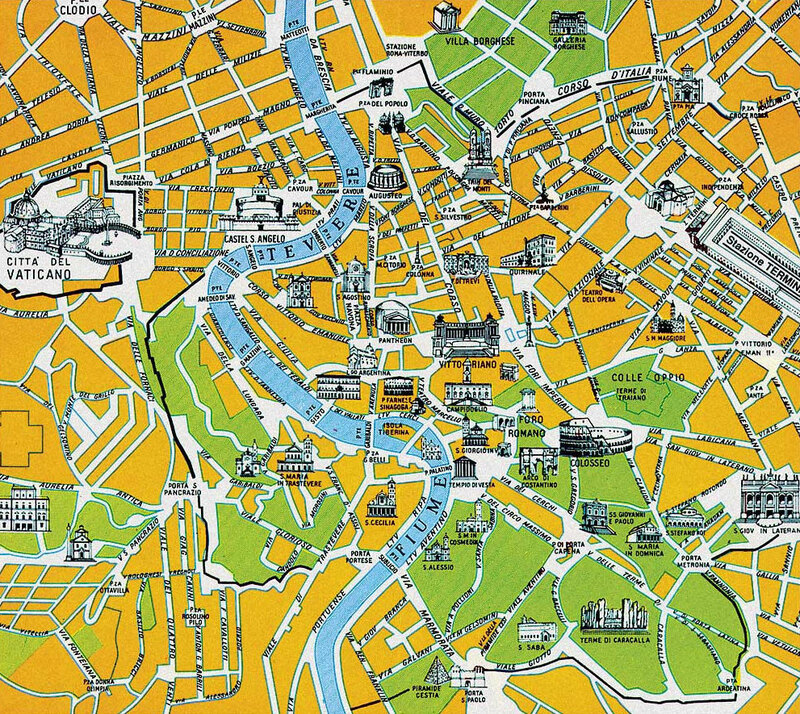 She pulled out the map and pinpointed where they were, then went about scouring the map of the famous city for its most famous sites. Michael cleared his throat, "Ally, are you going to pick something or are we going to stand here all afternoon?" "Sorry, I can't decide. There is just so much to see." “Well then it should be easy then," he raised his eyebrows at her amused. "Girl show me what you most want to see," he gave her a smile that looked a little off when his fake moustache moved unnaturally. It was weird hearing his soft voice in the odd get up he was in but she returned his smile, “okay, I think I have an idea.” It hit her right away when he said through your eyes. It instantly gave a different perspective. Through her eyes... or better, through her lens. She would lead him on a tour of the city from a strictly logically professional point of view. She would pick the places she would want to photograph as a photographer. She folded the map up in such a way to show the central area only and started to leave the safety of the parking garage area. She turned to speak to him, "you coming Mr. Jackson?." "Yes ma'am," he laughed as he fell in step behind her. "But call me Mr. Stooge, we don't want anyone getting any ideas." She shook her head, "oh brother. Okay." As they reached the Viale delle Belle, Allison looked at her map to see where they were. "okay, we turn left here." A short distance later they turned onto the Via Omero to follow it around a circular path where it became the Via Valmichi and they had arrived. The both stopped in their tracks. At the edge of the street was the entrance to the lush gardens of the Villa Borghese. It looked spectacular. Even thought they had walked through a mostly green residential area, you could tell this park was immense and the entrance was just as grand. They had reached one of the northern, more modern, entrances of the park. It featured the typical Roman style pillars, columned porches and open aired atriums. "Girl, look at this place," Michael finally spoke, his voice full of wonder. "Oh I know... wow, it looks incredible," she quickly agreed. As they walked towards the entrance Allison pulled out the pamphlet she had picked up in the lobby and started to read from the cover of the promotional material. "Okay listen," she read aloud. "The Villa Borghese, at 80 hectares or 148 acres, is the largest public park in Rome. Originally a private vineyard, the park was redesigned and enlarged in the early 17th century by Cardinal Scipione Borghese, the nephew of Pope Paul V. It was further landscaped following an English style gardens design in the 19th century. 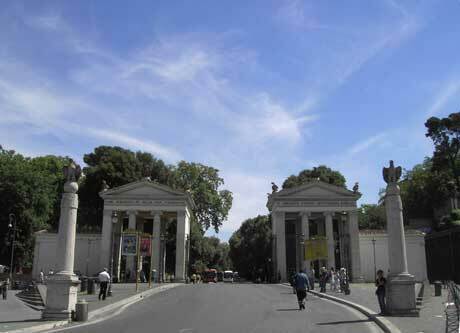 In 1903 the city of Rome obtained the Villa Borghese from the Borghese family and the park was opened to the public. The park features wide leafy and shady lanes, landscaped gardens, several museums, neo classical temples, beautiful fountains and many monuments and statues. 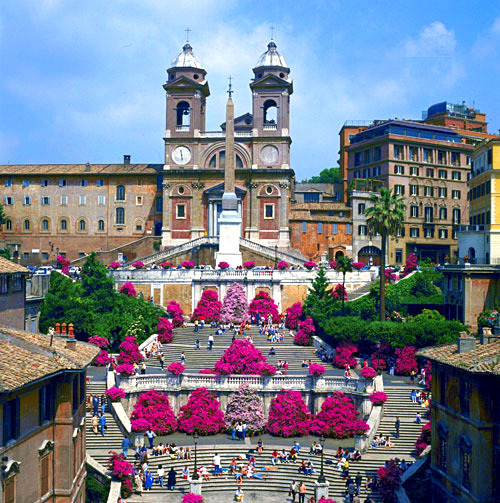 The Borghese Park is a pleasant refuge from the hectic streets in Rome." She stopped reading aloud to quickly skim the rest of the information. "They have boats you can rent to go out on the manmade lake or bikes that we can rent to ride through the trails," she tucked the pamphlet in her pocket as Michael shoulder brushed against hers as he reclaimed her hand, "let's just walk and see what we see. I don't want to do nothin' fancy." His voice was soft and whimsical , "I want to be up close," he said as he led her through the entrance. It was early afternoon and finally, after three days of warm but damp weather, the sun was shining in Rome. A light breeze blew from the south as they began their slow unhurried walk through the historic park. She hated to admit it, but it was the perfect day for 'sneaking' out. Not to mention, being with Michael site seeing was like being with an exuberant child or a man who had just regained his sight after years of being blind. Everything was a wonder that needed to be explored, touched and examined. He had said let me see Rome through your eyes, but right now she was actually getting to see it through his and she loved it. His jovial enthusiasm spread through her and reminded her just how little he got to be out on his own or even out at all. It made her happy just to see him so in awe of every little thing. The park was full of activity, but luckily wasn't overly crowded. Tourists were milling about, local children were running and playing in the soccer fields, teens hung out with their friends and families gathered to enjoy a mid afternoon picnic. Amazingly, even with all the activity the park remained tranquil and peacefully quiet. People were travelling on foot, mopeds, bikes or on the two-person park rental bikes, that looked more like an old-fashioned rickshaws or a modified golf cart. With her camera poised and ready Allison took dozens of photos of the fountains and monuments that they walked past, stopping when Michael wanted to get closer. She was happy the sun had finally come out, adding some warmth to her pictures. The walk in the park had calmed her some, but she was still somewhat leery of someone discovering that Michael Jackson hid beneath the disguise he wore. As they walked along, she realized she was keeping an eye out for the fastest escape route. More than a few times she saw fans of all ages wearing a Michael Jackson shirt or a Thriller styled jacket from his video. But Michael didn't seem to be worried, he giggled and laughed as he held her hand as the continued on. The only thing that she noticed is that he kept his voice a octave lower than when he normally spoke out in public and he was extra careful when he saw small children. Being sure to keep his head down or turn away. Her had told her before that he didn't think he could fool children. That is what he loved about then, you couldn't fool them at all. Rome. At the top of the steps, where they stood was a church. The Trinità dei Monti regally held it’s imposing position atop the 138 steps. They walked along the base of the church’s magnificent structure learning it’s long and storied history from the various bolted brass plates on stone slabs along the parameter. It was a beautiful old church, typical of the Italian Renaissance buildings in the early 1600’s. The church had actually first started out being constructed in French gothic style in the early 1500’s, but it didn’t get built when the construction stuttered and was never completed. However, years later the church was completed with its current design and was officially consecrated in 1585 by Pope Sixtus V. They also learned that during French occupation of Rome, the church had been despoiled of its art and decorations. But in 1816, the church was restored at the expense of Louis XVIII. It amazed them both to read such rich detailed history of this one small church here when Rome was filled with 100’s of churches. According to one of the brass plates there were over 900 churches in the city of Rome. Finished their tour around the church they began to walk down the steps towards the fountain at the bottom. It was crowded and jam-packed with locals and tourist sitting or standing on the steps. Allison squeezed Michael’s hand tight, her fear once again returning that someone would recognize him under his disguise and pandemonium would ensue. She looked around her uneasily, then back up the towards the church, looking for the an escape route if they needed one. She felt almost claustrophobic at the thought. This could not be safe. God there is nowhere to go if something happens here on the steps. Michael felt her hand tense in his, and he gently lifted her hand to his lips, brushing them softly against her knuckles. His fake moustache ticked her skin, “girl, c’mon, let’s walk down.” His dark brown eyes were calm as they assured her it would be okay. Michael didn't seem to have a care or a worry in the world that anything bad would happen. He was thrilled to be out enjoying a day with his girl the way he wanted to with the safety of his disguise. No one would be paying attention to him dressed in this outfit. She took a deep breath before she gave him a half hearted, "okay." Trying to sound as light and positive as she could so he wouldn't know how nervous she was again. But of course Michael knew. He guided them effortlessly down the steps towards the fountain in the open triangular square at the base. He manoeuvring them through the seated tourist and locals as if they were not even there, carefully making sure they didn't bother anyone and excusing them when needed. Allison couldn't help but smile proudly at how adept he was at being polite and congenial even thought he never really had the regular opportunity of social interaction with strangers in outside situations. And when he did, those complete strangers were usually trying to touch him or grab him. His quiet affable mannerisms were natural and before she knew it they had made it safely through the entire crowd with little effort. At the bottom of the steps Allison took a few pictures of the church from vantage point of the square. It really was quite impressive perched at the top of the steps. The steps themselves were also stunningly beautiful. The yearly spring festival held in April had just ended and there were still hundreds of potted pink azalea's sprinkled and scattered along the steps with people wedge and seated in between them. They didn't remain at the bottom of the steps for very long and they made their way towards the Trevi Fountain. As they started their walk Allison searched in her bag for information to give Michael about their next destination. But this time he surprised her by telling her what he already knew about the famous fountain... and of course being Michael, he knew a lot! On the short walk south he told her that the fountain's name came from the fact that it was situated at the intersection of three different roads and that tre vie meant “three-way” in Italian. He said the fountain was at the endpoint of an aqueduct called the Acqua Vergine. Which was previously known as the Aqua Virgo in ancient Roman times. Which had been 1 of 11 aqueducts the ancient city had had. Allison shook her head at his factoid knowledge, "what? How on earth do you know that?" Michael gave her a amused look, "don't you read anything?" "Ah yeah I read Michael, but nothing recently on the waterways and aqueducts of ancient Rome," she replied smartly. "And if I may ask, why are you?" "Michael," she poked his side, "reading about ancient Rome." "Well, you know what they say, when in Rome,” he began to giggle. He really was enjoying himself. “Whatever Michael,” she replied, slipping her arm around his waist she suppressed her own laugh against his coat. Because where the fountain was located, the only way for anyone to reach it was on foot. It was a short walk from the Spanish Steps and it didn’t take them long at all. They walked past the dozens of vans and tour busses parked on the narrow side streets that had brought the other travelers and sightseers to the famous spot. The location of fountain was such that you could easily miss it if you didn't know it was there. Surrounded by shops, restaurants and hotels, the area was quite modern and you wouldn’t expect to come across a famous landmark, let alone one of Italy's most famous. The area was absolutely jammed packed with people and it was virtually impossible to move around or get to the front edge. But even from where they stood at almost a hundred feet back, the fountain was stunning. Allison pulled out the info she had on the fountain and read it aloud to share with Michael. 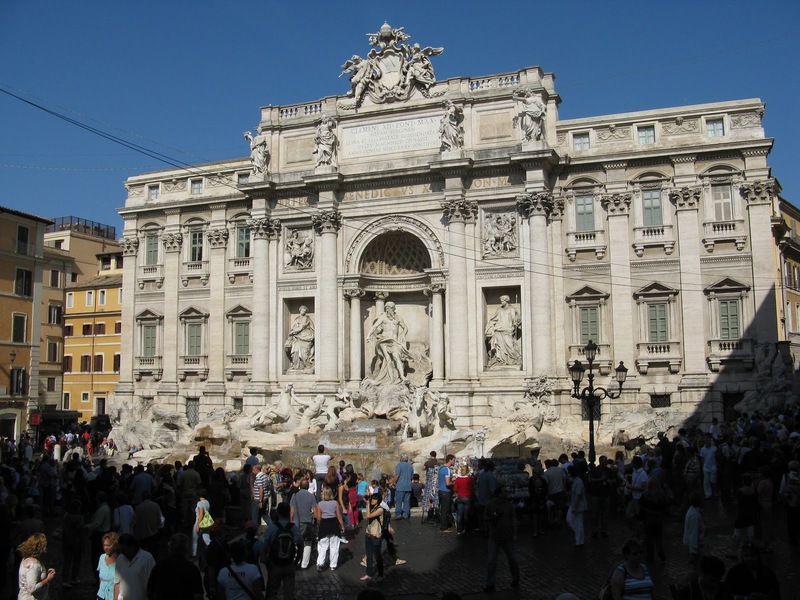 It had been completed in 1762, standing at 85 feet high and 65 feet wide made it the largest Baroque fountain in Rome. The fountain's centre featured Neptune, the Roman god of water. On either side of Neptune were two Tritons, Greek gods known as the messenger of the big sea, one struggling to control a furious hippocamp, a mythological seahorse and the other leading a much calmer hippocamp. In the pamphlet it said that the Tritons and their horses represented the nature of water, calm one minute and raging and powerful the next. She then went on to explain the ancient tradition of throwing coins in the fountain. That the old legend maintained that if you throw coins into the fountain, you are assured a return visit to Rome. An estimated 3,000 Euros are tossed into the fountain each day and the city collects and donates the money to local charities. As she continued to read from the pamphlet Michael took the time to look around them. He was so delighted to be just standing there taking in all the sights and sounds swirling around them. To him it didn’t matter if it was crowded or if they couldn’t get near the fountain. This is what he wanted. Being here with her out in the open, out in public with everyone. It was incredible. The area was packed with so many different people, from all over the world and all walks of life. Rich, poor, old, young, children all here... all together. Michael could hear all the different languages being spoken, kids running and playing, parents chasing and scolding, people smiling, taking pictures or just standing like he was. This was real, this was what he never got to see, hear or touch. It was intoxicating. He was so lost in his thoughts he hadn’t noticed she had stopped reading and that she was speaking directly to him. “Uh hello,” she waved her hand back and forth in front of his face, finally bringing him out of his trance. She couldn't agree more seeing him wide smile, "yeah it sure is." Before leaving the area they managed to get a bit closer to the fountain, but it was nowhere near enough to throw their own coins and make a wish. But that really didn't matter to either of them. They were both having so much fun, enjoying the time out and acting like tourist. Allison even managed to let go and forget that Michael was in his required disguise. Walking around with him, snapping pictures and taking in the sites seemed natural and relaxed. Next on their hit list was the big 'one' the Coliseum. As they walked past all the fancy shops and outdoor cafes, Allison spied a traditional Italian Gelato and Pastry shop and mentioned maybe they could go in and get something. When Michael told her he had never had gelato before then she insisted that they go in. "You will love it," she chimed. " It is just like ice cream, only like a million times better and super yum!" The name of the store was Giolitti and the sign on door said they had been in business since 1900. They went inside and it was absolutely chock-full with people in the seated sections and there was a long lineup placing orders for takeout. The shop was drenched in old world charm. Complete with wooden pedestal tables and antique folding chairs, brass fixtures and large glass chandeliers. Large and tall windows framed the expansive view of the square. The line for takeout moved quickly. Michael kept his head down to ensure no one would recognize him but he was also trying to decide on what flavour he wanted. It was one tough decision, there must have been over a hundred different flavours to choose from in the tiny store. When it was their turn to order, Allison got the refreshing Limone, that was tangy, tart and sweet and Michael settled on cioccolato, an old fashion chocolate flavor that he loved. As the continued their walk, he watched her happily enjoy her sweet treat. Even thought she had put of a fight and said that she didn't want to go, she was having a good time. Just like he knew they would. He could hear it in her chatter and see it in her smile. The past couple hours had been exhilarating and wonderfully uneventful and downright normal. Seeing the sites and touring around on foot, unfollowed, unguarded and unknown is what he had always dreamed of. To walk around without anyone thinking he was any different then themselves. It was something he had never had in his entire life. He was always Michael Jackson, the superstar. Never just Michael Jackson, the man or person. People just couldn't think of him that way and it made it very difficult for him to find real friends or to go out anywhere. They would have to do this more often. When they reached the Coliseum they tagged onto one of the last guided tours of the day. The guide was fantastic and shared many known and unknown facts about the ancient site. She told them it had originally been known as the Falvian Amphitheater and had been constructed over a period of 8 years. Completed in 80AD it was considered one of the greatest works of Roman engineering, capably of seating up to 50,000 spectators. It was used for gladiator battle contests and public spectacles such as mock sea battles, animal hunts, executions and re-enactments of famous battles. They heard and learned about the inner workings - how there were trap doors beneath the sand floor and exotic animals would be released at the same time so everyone in attendance could have a good view. They were shown where the emperor sat as well as the front row area seating for Vestal Virgins, reserved due to their elevated status. 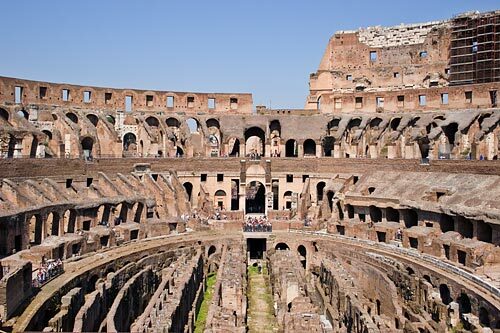 Apparently that was a big deal, as the other woman that came to view where often relegated to the top rows of the amphitheater as it was believed they might "tempt" the gladiators and prompt them into infidelity. By the time the guided tour was finished Allison became aware that it was much cooler and the sun hung low in the sky. The time of day had escaped them both as they found themselves submersed in the history and folklore of their surroundings. With so much to see and so much more to do the afternoon slipped away quickly and both Allison and Michael had become wrapped up in being tourists. Neither one of them knew the time, but it was obvious it was early evening. It was Allison that finally took note of the time as they returned to the ground entrance of the coliseum. "Michael, we've got to get back! It is almost 6 o'clock," she looked at him panicked. Thank you for the lovely trip around Rome. you know what Trish.. that is my favourite part too! Michael appreciated everything... and you are right - helps us to remember that. Thanks for making me smile on that thought. Cheryl , what a lovely update! Wouldn't it have really been wonderful if Michael truly had this chance of walking through Rome like a normal person and not a superstar ! Tanks for talking me on this journey through Rome.. I felt like I was there all over again. 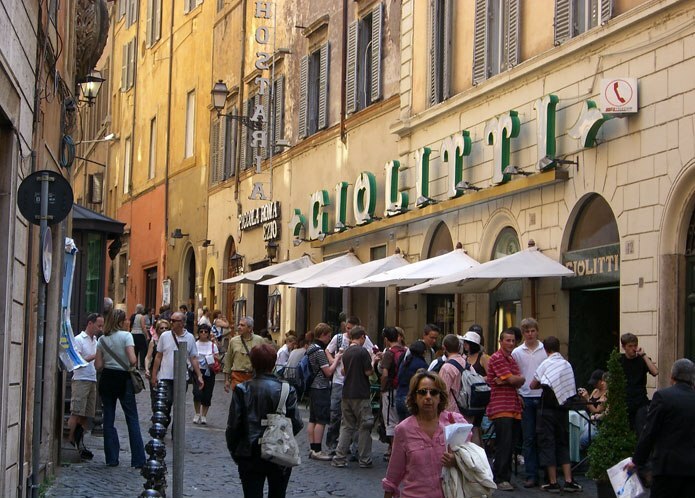 I loved visiting Rome with it's quaint shops an lovely views . Seeing history..but seeing it through Michael's eyes was and would have been amazing! Didn't think we would get an update..since it was on hiatus last time I looked! So glad to see it..was well worth the wait.. I can't wait for more! Ahh Rome , I was there sooo long ago , such a magnificent city , so much history , Michael would have loved it for sure :) Great to read that they had this opportunity. I enjoyed walking with them through the city , studying the map . "He was so delighted to be just standing there taking in all the sights and sounds swirling around them. To him it didn’t matter if it was crowded or if they couldn’t get near the fountain. This is what he wanted. Being here with her out in the open, out in public with everyone. It was incredible. The area was packed with so many different people, from all over the world and all walks of life. Rich, poor, old, young, children all here... all together. Michael could hear all the different languages being spoken, kids running and playing, parents chasing and scolding, people smiling, taking pictures or just standing like he was. This was real, this was what he never got to see, hear or touch. It was intoxicating "
Well done Miss C , well done . Oh crap ....now back to the hotel , Michael ,you have to perform tonight !!!!!!!!!!!!!!! LOL , I wonder what will happen next ? Hi Nancy. Yes I seemed to have fooled everyone with hiatus... I iwll have to apologize for that. It seems my real like out in the world is keeping me busy and away from Michael so I was not sure when I would be able to update... and I didn't want to make promises that I could not keep.... so when it was ready, I thought I can just post it up. But that is okay, that way I know exactly what parts you liked and why. you have given me such a long comment, I feel bad that I am repeating myself... because again I agree with you too.. how lovely to watch him enjoying his rare freedom... out walking and watching and having a gelato... normal everyday stuff that we could do anytime, but he finds it intoxicating. I do believe they may sneak out a few more times together now that he has the tourist bug! We shall see. YES they do need to get back... he needs to get ready, get to the venue and get his voice warmed up! They need to get back fast... I guess we will find out next chaper what happens. A lovely chapter, and a nice tour of the great city of Rome! I was there in 1989, saw all the sights that Ally and Michael saw plus a whole lot more, including Forum Romanum, The Vatican City, Panteon... Gosh... I could go on forever. It is such a fantastic city, so full of history. Thanks for a great chapter, C.
Girl that was totaly awesome. I just love when you do these chapters you make me feel like I am there with them. The pictures and descriptions are just fantastic. I love how you show the human side of Michael where we seem to forget he was just as human as the rest of us and he rarely could enjoy just being normal with his girl. Thanks so much girl I always loveyour updates so much. I am going to miss the blog so much but wherever you go I will be there! Don't know where to leave this C.. Love the new blog...! Looking forward to reading more!!!! Hey Nancy! Leaving it right here is just fine! Thanks for coming by! Still lots to do, but I am glad you like it! What a nice new home you have made here!